Bobby Orr passes to #16 Derek Sanderson (out of the picture) behind the net, goes to the front, Sanderson passes the puck and Orr scores the coolest goal in modern NHL history, beating veteran Glenn Hall of the St. Louis Blues in overtime. Boston wins the the series 4 games to 0 and the Stanley Cup (1970). 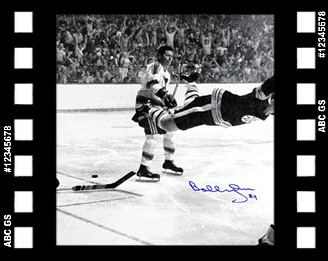 40 seconds into sudden death Orr scored the famous goal taken by Ray Lussier who arrived late to the game that night.